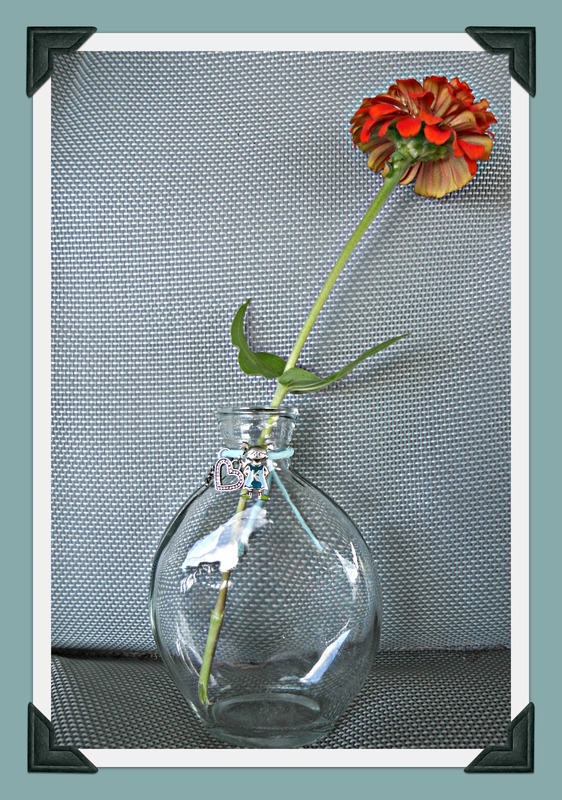 Some of the blooms can be sent to you on a stem just right for arranging in that perfect bud vase. Possibly you would like to create that one-of-a-kind bookmark or attach a pretty poesy to your shopping bag. How about up-dating that lampshade in your boudoir? Or tying back your curtains for that vintage Victorian look; the uses are endlessly possible. Do you need pretty glass buttons for your handmade piece? For those who may not know I fuse glass and adore Dichroic. Here is a little history on this type of fancy as well as expensive glass so a little for me goes a long way. Dichroic glass is glass containing multiple micro-layers of metals or oxides which give the glass dichroic optical properties. The main characteristic of dichroic glass is that it has a particular transmitted color and a completely different reflected color, as certain wavelengths of light either pass through or are reflected. This causes an array of color to be displayed. The colors shift depending on the angle of view. Dichroic glass is an example of thin-film optics. I make many things out in the shop and will once it is spring and sadly winter has just begun. Here are two different offerings from me. Glass buttons! Tonight I am resting up for what they say will be a doozy. Some say 5 inches and others say 12 inches of white fluffy snow will blanket our yard by morning now if you know me I will hope for the 5 inches. Tonight I went and met up with two of the other members of our garden club for a decadent treat at a new place in town. It was worth every penny! It was funny to leave the house without my boyfriend and my little girl JT but to put my hair up and put a clean outfit on and take off into the snowy night felt like the old days. I made more jewelry today as I got up each hour to throw out more seed for the Doves, Juncos, Cardinals, sparrows, nuthatches etc. as the little finches hogged the feeders all day hardly letting a seed get by them and dropping to the ground. As I worked on my pieces and watched them frantically eat and eat I knew we going to get nailed by this storm. squirrels’ had been here till 3 PM then they went to their nests. Wonder where all my beautiful birds will spend the night I surly hope in the dense forest behind the house. It was a balmy 16 degrees at 5 PM tonight and only getting colder from that point on. When I woke this morning it was 0 degrees. Sadly winter is upon us yes it will be pretty to look at and I promise you will see some photos as you know me. They will not be perfect but they will tell the REAL STORY. My shoulder is feeling OK as I had yet another shot on Wednesday. I have an appointment with surgeon to have bicep repaired when I call uncle or spring is on our doorstep you see winter is here and my home and yard require more than just one set of hands and legs to keep it clear and safe. I think I taught my doctor something I hope he remembers for many years to come that not everyone has the money to pay others to do all that needs to be done. I left in tears with him saying he would worry about me on the roof but that he now understood more about the kind of woman I was. I do not shirk responsibilities hurt or healthy. Back to fun stuff want to see? I also took out a tree skirt I made as a teenager yes it is ancient and some ornaments I did back then. Perfect night for it belly full of yummy cake snow falling an inch per hour or maybe a little more and the dog at my feet as I write this post. When I come in from shoveling tomorrow morning I will upload some photos for you to see. Selling flowers and candles some jewelry too! So Sat. we had a Holiday Craft Fair for a good cause CHILDREN. The Garden Club had donated items at that table and 2 club members to run it they also had the plants I went to pick up for it and the order sheet so more could be sold. Well they sold enough of the items to cover the $20 table set up fee and made a few over and then sold some plants that will come by truck on the first of December from the grower. I brought some of my fused glass items, beaded pieces and hoop earrings and candles. I should have brought more candles! I sold them for $2.00 a pair and I warn you they were pretty compared to these photos I took in bad light and rushed. Poinsettia for sale also spent time in my kitchen. So over all a great day and maybe just maybe a few new members! 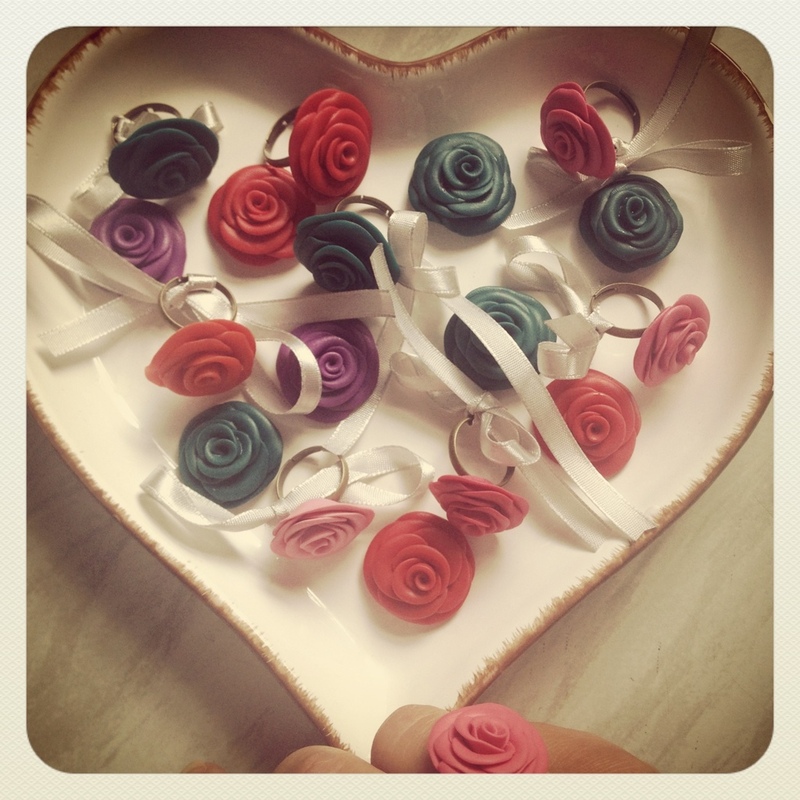 A nice day to read blogs, play with the pup and make a few pretty things for the Holiday Fair. 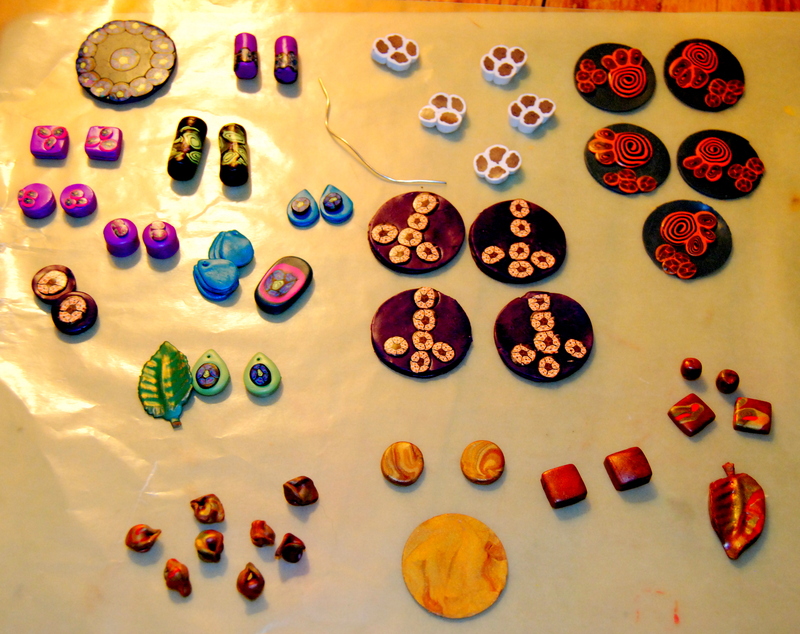 While I wait for results on my MRI I decided to play with my Polymer Clay. I will be doing a craft fair locally in November so I better get busy and create. I had my breakfast and did the dishes and swept the floors and before I knew it I was gathering supplies in my nightgown and sat down and began to play. Creating something colorful and wild again. It has been awhile since I just sat and played. Felt good. I looked up at 1:00 PM and I was still in Nightgown with many pretty items to bake so I can turn them into pieces of jewelry for the sale in November and maybe some for my friend’s store in Newburyport too. 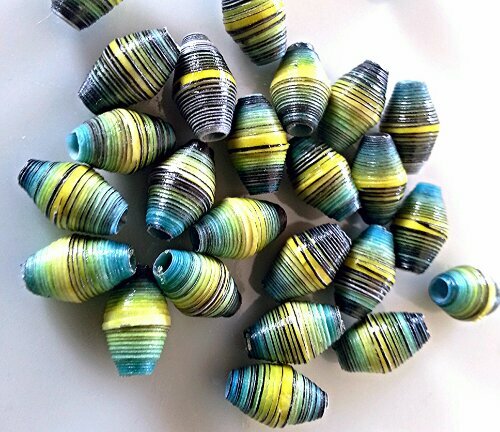 I made these paper beads by printing templates in MS Word. The templates are very easy to create . I used an isoseceles triangle shape. This option is present in the ‘basic shapes ‘ option . Once I could draw the triangle, I specified the width of triangle and filled with colour using the ‘fill effects’ option .I copied the same and printed the same . Then all I had to do was cut and roll into beads. and played with that pretty pup. I will be at a yard sale today and possibly tomorrow if we do not find wonderful homes for all these lovely, used items. I will bring my jewelry to see if there maybe any interest in the crowd today..I love beading but people are so different you just never know what will make them say “I have to have that!”. I try to remind myself that what I make is pretty and unique but in the back of my head if they do not purchase something, I really am thinking I will make something better next time. Why do we do that? I know the economy is bad and the last thing people think of is a new piece of bling when they are loosing their homes to their banks. I must go easy on myself and not fall into the trap of just giving them away. My bracelets take 4 to 8 hrs depending on the stich I use. I use tiny seed beads, most people can not even see the holes in them. I do Herringbone,Tubular Peyote,Flat Peyote, Even Count as well as Odd Count. I make Eyeglass lanyards in either Sprial Stich or my favorite Kumihimo. This one I do has 8 bobbins I fill with cords pre-loaded with beautiful beads. Then you get into a rythem and before your eyes this beautiful cord starts to appear. I sell these too and make them with pretty glass beads but the time and cost of supplies plus something for my time always seems to be too much for those who check them out. I will work on a piece at yard sale so they can watch and see what actually goes into each piece I make. This will keep me from eatting fried dough too! Hope you all have a wonderful day out there in your world ! I will post photos tonight, no time now. Just about 6AM I better get ready!